George Goniwa performs for the City Buzz team. George Goniwa had a few tricks up his sleeve, performing in the heart of Maboneng, Gauteng. The streets of Jozi are known for the dreams and aspirations of Joburgers. Rarely is magic associated with the Jozi CBD streets, unless it’s after a couple of shots on a night out. 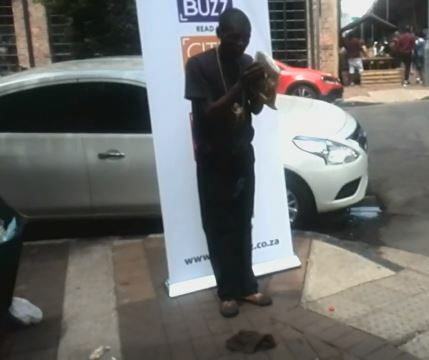 On the last day of City Buzz’s new look activation at the Maboneng Precinct, the team was lucky enough to witness street magic at its most unexpected and finest. Street performer and magician George Goniwe did more than read a copy of our March edition – he used his copy to show us the magic that’s hidden in the streets of Jozi.